It’s not very easy to like tofu. Isn’t it? I mean, it’s good but you always need to season it well in order to like it. Once I was served a block of tofu with just some salt and pepper on top. I am usually the least picky eater you can find around but even I was not able to finish that. Seriously though, who serves a block of tofu like that? Some of my favorite tofu recipes are obviously Indian. 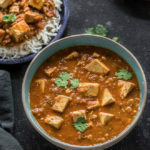 I think all the masala and spices give it so much flavor like in this Tofu Tikka Masala the tofu cubes are marinated with spices making it so flavorful. 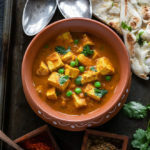 If you don’t like tofu or simply want to find a recipe which can make you like tofu, try an Indian recipe. This Instant Pot Tofu Matar is one recipe where you can start from. It has tons of spices cooked together with tofu and green peas – so good! 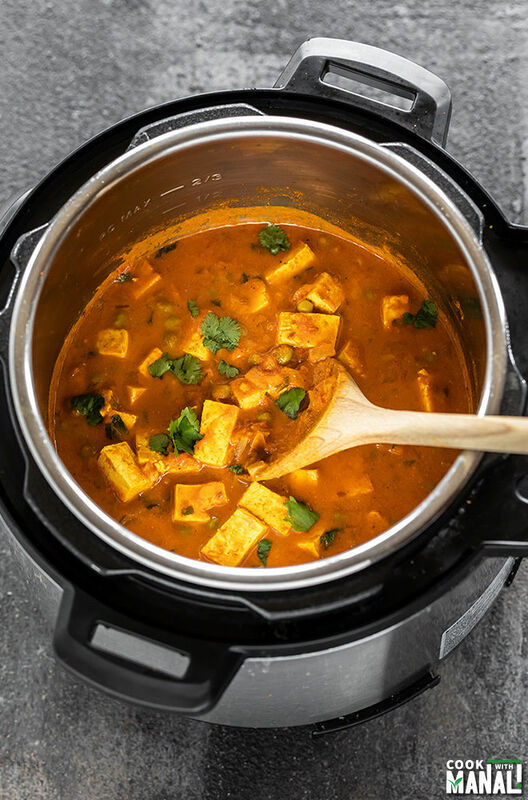 This instant pot tofu matar recipe is a take on the classic and very popular Indian dish – matar paneer. The combination of paneer and sweet peas goes very well together. 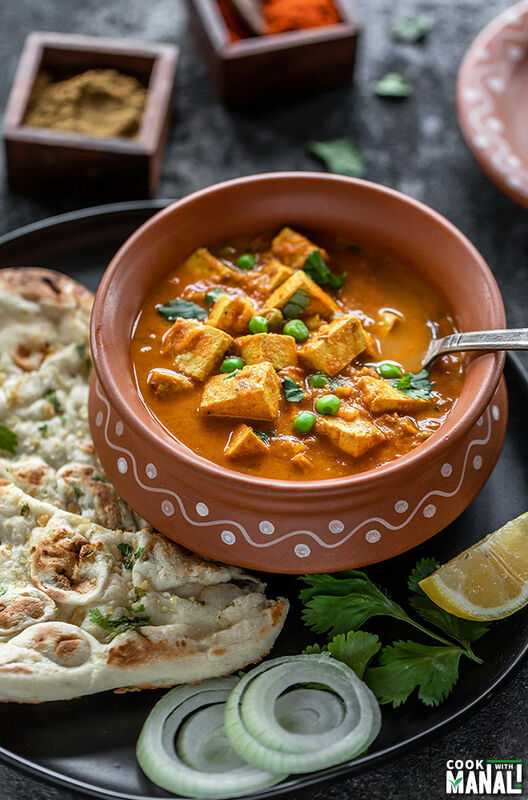 For the vegan version, I replaced the paneer with tofu and it tasted just as good. Sarvesh is not a tofu fan (in fact he usually tries to avoid it whenever he can), but he ate this without a fuss – that itself is an achievement! This recipe has a ton of spices, there is coriander powder, garam masala, turmeric, cumin, chili powder and some smoked paprika. You can skip the paprika if you want and you can even skip the chili powder if you want to keep it less spicy. I did not add any green chilies here since there are a lot of spices going on already and I didn’t want it to be super spicy. You may use green chilies if you like. For this recipe of tofu matar, I have used extra-firm tofu. 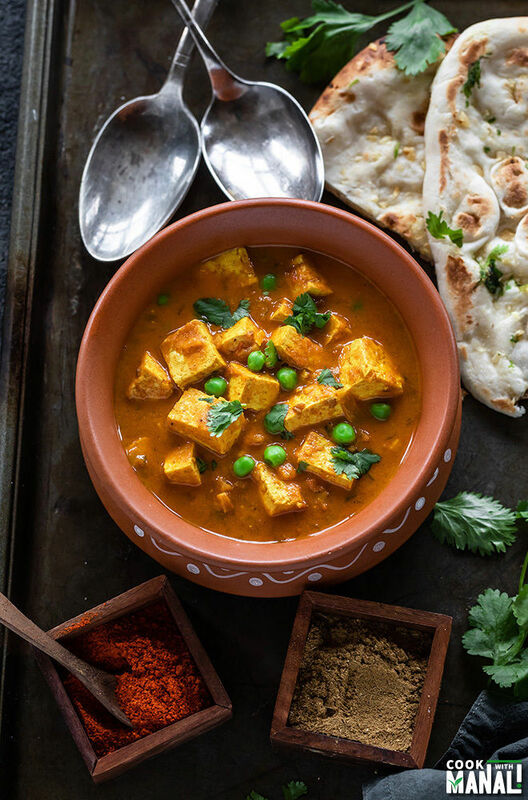 For most of my Indian recipes, I prefer to use extra-firm tofu. 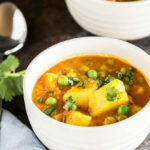 I think it’s important for the tofu to be firm and have a nice bite to it in curries. While using the extra-firm tofu, I make sure to press it with a heavy object for 10-15 mins to drain the excess moisture and then cut it into pieces. This dish would actually taste so much better if we used fresh green peas. But since it’s not something readily available, I have used frozen peas. Please use fresh peas if you can get your hands on them! Don’t have an Instant pot or pressure cooker and still want to make this Tofu Matar recipe? No problem! You can make this recipe easily on stove top using a pan. You don’t have to change much. Follow all the steps as listed until add the addition of tofu and matar. Once you have added the tofu and peas, stir and cover the pot with a lid. Let the curry simmer on medium heat for 10 to 15 minutes until all the flavors blend in well together. Garnish with cilantro and serve. You might need to adjust the consistency of water when making this on stove top as water evaporates when you cook on stove top versus pressure cooker. So thin out the curry towards the end, if needed. *Drain water from the tofu and then press it with a heavy object for 10 to 15 mins to get rid of excess moisture and then cut into pieces. 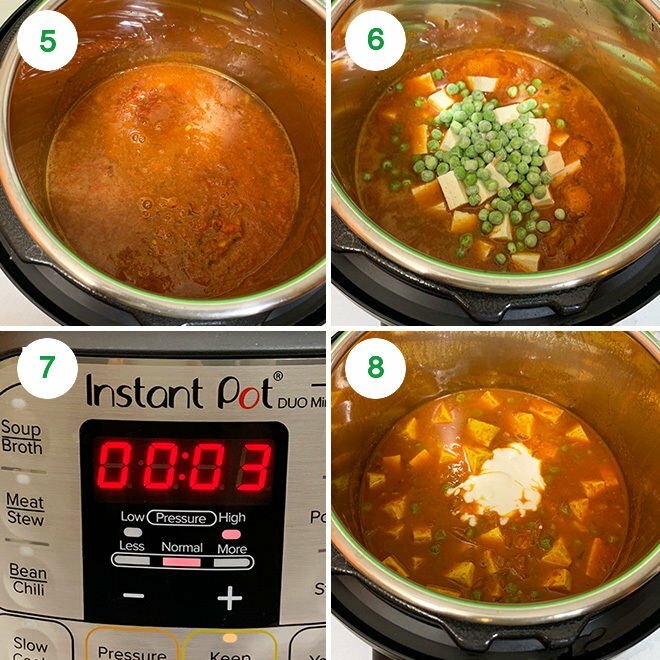 1- Press the saute button on the Instant Pot. Once it displays hot, add the oil to the pot and then add the cumin seeds. Let the seeds sizzle for few seconds. 2- Then add the onion, garlic and ginger. Cook for 2 to 3 minutes until the onion is soften. 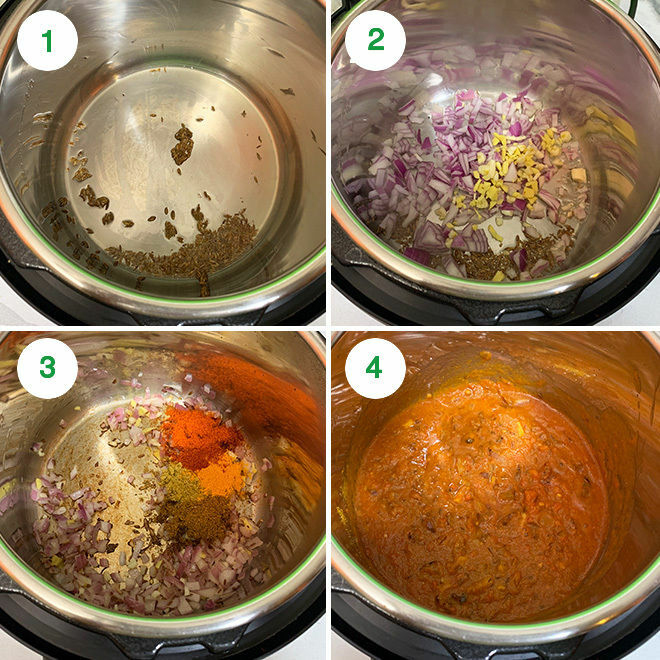 3- Then add all the spices – coriander powder, turmeric powder, garam masala, cumin powder, red chili and smoked paprika (optional, if using). Stir the spices with the onion for few seconds. 4- Stir in the pureed tomatoes along with the tomato paste and mix well. Cook for 1 minute. 5- Add 1 cup water, salt and mix. 6- Add in the tofu and green peas. Stir and close the pot with its lid. 7- Cook on high pressure for 3 minutes with the pressure valve in the sealing position. Let the pressure naturally for 5 minutes and then release the remaining pressure manually by moving the pressure valve from sealing to venting position. 8- Open the pot and stir in the yogurt. Mix well. Make sure the yogurt is whisked and at room temperature before you add it in. 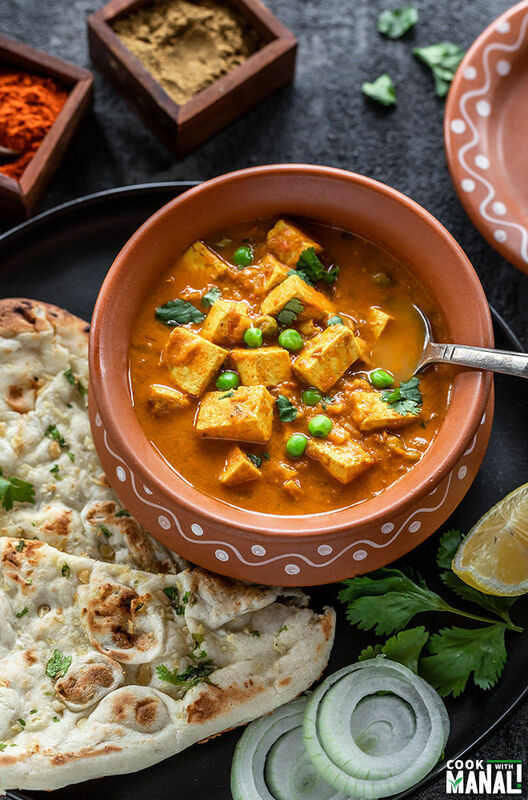 Garnish instant pot tofu matar with cilantro and serve with rice, quinoa or any bread of choice! 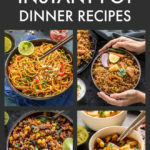 If you’ve tried this Instant Pot Tofu Matar Recipe then don’t forget to rate the recipe! You can also follow me on Facebook, Instagram to see what’s latest in my kitchen! Tofu and matar (green peas) cooked together in a spicy tomato based sauce! 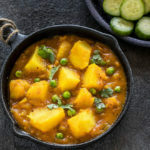 This vegan and gluten-free curry tastes good with just about any flatbread or rice! Press the saute button on the Instant Pot. Once it displays hot, add the oil to the pot and then add the cumin seeds. Let the seeds sizzle for few seconds. Then add the onion, garlic and ginger. Cook for 2 to 3 minutes until the onion is soften. Then add all the spices - coriander powder, turmeric powder, garam masala, cumin powder, red chili and smoked paprika (optional, if using). Stir the spices with the onion for few seconds. Stir in the pureed tomatoes along with the tomato paste and mix well. Cook for 1 minute. Add 1 cup water, salt and mix. Add in the tofu and green peas. Stir and close the pot with its lid. Cook on high pressure for 3 minutes with the pressure valve in the sealing position. Let the pressure naturally for 5 minutes and then release the remaining pressure manually by moving the pressure valve from sealing to venting position. Open the pot and stir in the yogurt. Mix well. Make sure the yogurt is whisked and at room temperature before you add it in. Follow all the steps as listed until add the addition of tofu and matar. You might need to adjust the consistency of water when making this on stove top as water evaporates when you cook on stove top versus pressure cooker. Hi Manali, Love your site! I didn’t realize I had just landed on a *new* recipe– would it also work to use dairy yogurt if that’s what I have on hand? Hi Catherine, yes dairy yogurt works well! Just make sure it’s at room temperature and whisked well before adding else it will curdle. you can always add a little bit of cornstarch also to the yogurt to bind it so that it doesn’t curdle. Hope you like it! Hey Manali.. what’s the difference between tomato purée and tomato paste? And what difference does it make? tomato puree is diluted whereas tomato paste is concentrated…approx 1 cup tomato puree = 2 tablespoons tomato paste plus water to make 1 cup…paste gives a strong concentrated taste and I love adding it to curries for that rich tomato taste.